Every year the Reno News & Review does a poll to find out who is the best of Northern Nevada. Then they plan a big party to celebrate the great things about our community and especially focus on the people, the businesses and the culture that makes Reno and Northern Nevada a great place to live. 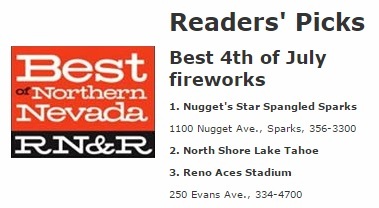 According to the Reno News & Review website, this year was the biggest reader’s poll yet! They had 88,484 votes in 345 categories. My company was the lucky winner of two awards. 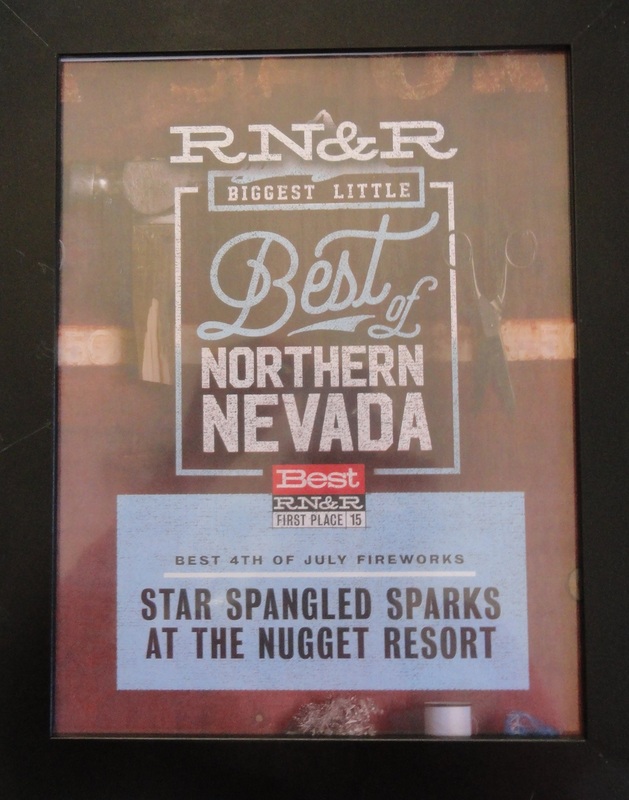 We took home Best 4th of July fireworks for Star Spangled Sparks event on the 4th of July, and Best special event in downtown Sparks for the Best in the West Nugget Rib Cook-Off. The awards party was Friday night at Peppermill Resort Hotel at Edge nightclub. We had a great time at the party. We ran into friends in line to get in and we were able to meet some local business owners. We were excited to meet the owners of Sup Restaurant, one of our favorite places to eat! The party was a blast. First you check in at the entrance, pick up the awards, take winner pictures and then you are free to get a drink at the bar and celebrate with other winners. The Peppermill served delicious appetizers and the desserts were amazing! Good thing diets always start on Monday…at least that is what I’ve been told. 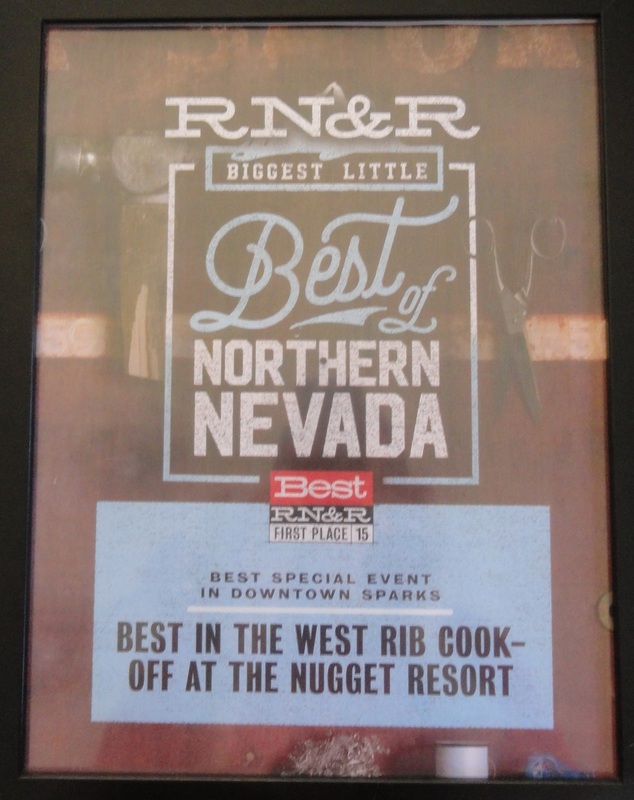 Special thanks to Reno News & Review and their staff for recognizing all of us for our hard work and contributions. It inspires me to keep moving and doing the best I can because I know the events I help produce make a difference in our community. Reno News & Review you also make a difference and we appreciate you! Thank you for planning this fabulous awards party and for allowing the readers to vote on the Best of Northern Nevada. Want more information on the Best of Northern Nevada award winners? See all winners listed here. Today we had a funny discussion about marketing in my office. Our Millennial Financial Analyst was asking why we buy so many 5 second ID spots on our local TV news programing. I said “Duh, that is where our clients are!” He looked at me like I was crazy. So my coworker and I told him why we are big fans of local media. First of all, you have to ask who the customers are. I work in Gaming, my customers are usually 45+ and they tend to watch the local morning and evening news. Of course the Millennial didn’t get it, he was born into a different generation of technology than our average customer. He probably doesn’t know when the news is on even if he wants to watch it. The Millennial doesn’t listen to local radio or watch local TV, but you know what else, he doesn’t gamble! Most in the Millennial generation don’t gamble, at least not yet. So he isn’t our target market. We buy advertising with local media as much as our budget allows. We have been very successful in marketing our entertainment and special events with traditional media advertising. We also buy online advertising and participate in social media, but it is much easier to get feedback from the traditional avenues of advertising. In addition, we need local media. They are a great resource and the only media that truly cares what is going on in the Biggest Little City. The reporters are our neighbors, and they cover our special events and are customers at our businesses. We need local media to make our community a great place to live. Local media is fantastic for promoting special events. They have been good to me over the years as an event producer. Every time I do an interview on a local TV station or even local radio I get feedback from friends and family that they saw or heard my interview. Last time I was on KOLO Channel 8’s Good Morning Reno show at 5:45am to promote an event my phone starting ringing instantly with friends calling and texting to tell me they saw my interview. Disclosure: Link is not to my interview but another event they covered recently at the Nugget. Also keep in mind how important local media is when you are buying advertising. We support local media and they support us. New media is great, but if you are an event planner or a small business don’t forget about traditional local media. I’m thankful for local media and the opportunities they provide for us to promote special events.